This simple chicken dish has been in my weeknight repertoire (do I have a repertoire?) since I was a newlywed and was learning to cook. It is the easiest pan sauce to make. It's great over sauteed spinach, over pasta or just on its own with some grilled asparagus bundles. Season flour w/ salt and pepper and dredge the chicken breasts, shaking off the excess flour. 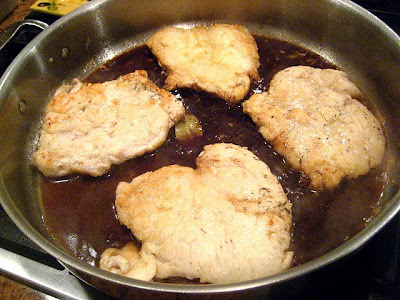 Brown in a large heavy skillet until golden, about 4 minutes each side. To the pan add the minced garlic and cook 1 minute until fragrant. Add the stock, vinegar, bay leaf and thyme to the pan. Simmer the sauce with the chicken for 10 minutes with the lid on. The sauce will reduce and become nice and thick. Swirl in the butter for some added richness at the very end. Cut off woody stems of the spears and toss w/ kosher salt and olive oil. Roast at 400F for 15-20 minutes. I tied them with my roasted peppers to add some color to the plate. I'm wondering why we weren't at your house for this last night. I'm trying it soon. Stay out of the snow. p.s. I need photo lessons...yours are excellent. I love balsamic sauce, yummy! I love that your cookie sheet is almost, ALMOST, as beat up as mine! Just ordered Michael C's cookbook from my local library, yesterday's Winter Panzanella Salad clinched that deal. How about some soup for tomorrow Stacey, to help us deal with all this snow? I like it. Especially since your pan sauce contains no extra flour. I'm off flour, cornmeal and sugar again. I know "BORING"! Sounds like a great pan sauce. I have all the ingredients so I'll try it! I have about 8 assorted size baking sheets, but the ones I always go to are the ones with the baked on "stuff" that can never be cleaned. The shiny ones I save for company! This looks delicious! Does it have a strong balsamic vinegar taste? 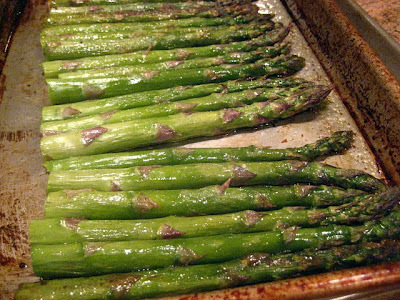 The grilled asparagus looks incredible also! Thanks! This is a great go-to meal, and I love the little red pepper ribbon around the asparagus. So easy...perfect for a weeknight meal. Heh, I knew I'd love it just from the name. Looks fantastic, I love pan sauces. This is going to be tried. Chicken with a pan sauce - what a perfect weeknight meal! It looks great with the asparagus bundles. Stacey, what a beautiful dinner with some fabulous flavors. So often a wonderful dinner gets made over & over again, because of its simplicity and the memory of its delicious taste. So many of my favorite flavors going on. Balsamic vinegar is one of top faves. Pan sauces are so easy, and don't you love how it cleans the pan? We both love asparagus the same way, but I loved your red pepper touch. I love this sauce - I am going to try your version - it's simple but packed with rich flavor. ow. Can I be hungry again? Stacey your repertoire is bursting at the seams with great ideas and always inspiration! Simple, healthy and flavorful - my kind of dish. Always good to have a pan sauce in your back pocket! Looks great! Your repetoire is enormous since I'm always impressed with your prolific assortment of recipes. Perfect simple combination of flavors here. I need this one for my own repetoire!